During summer months, our Cambridge partner school, Embassy English, organizes youth courses for students aged 12 – 17 years. Summer courses are based at the year-round international school Bellerbys College. The campus is located in the north of the city in a quiet residential suburb. Classrooms, sports facilities and lunches are all on one site. The students will be accommodated in host families, located near the school or in the school residence. School accredited by the British Council and EnglishUK. Fully equipped classrooms, with interactive whiteboards to aid learning. Sports facilities on-site (multi-purpose sports hall, football pitches, and tennis courts). Common areas with: Satellite television, DVD player, X-Box, and table football. Modern cafeteria serving lunches, with a variety of menus suitable for all tastes and diets. The cafeteria is also selling a variety of snacks, fruit as well as hot and cold drinks. Free wireless Internet access across all areas of the college with PCs in common areas. Sports: Football, Badminton, basketball, table tennis and tennis. Non-sports: Giant board games, arts & crafts, drama and music. Evening activities: Talent show, discos, barbecue party and film night. 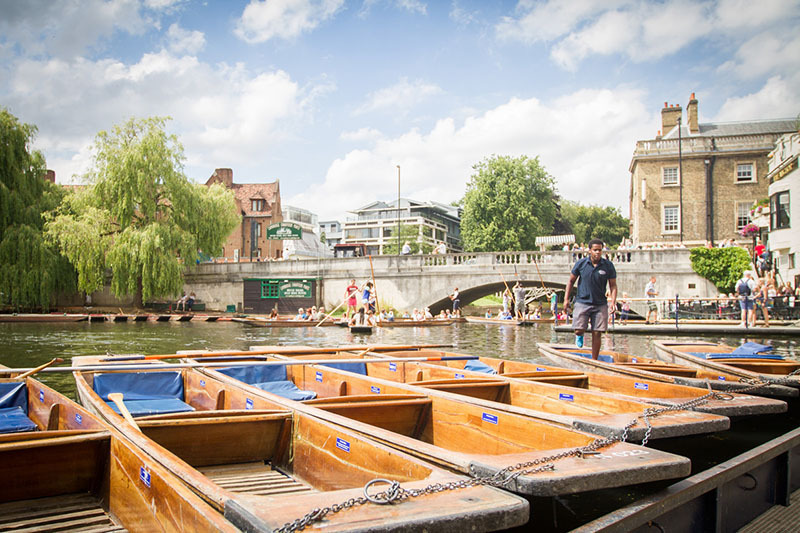 The programme includes one full-day excursion by coach each week (London, Oxford, Stratford-upon-Avon) and two half-day local visits to Cambridge each week. Host Family (13-17 years): in double or triple rooms on a full board basis (with lunch in the cafeteria). The room is shared with students of the same gender but with a different nationality. The host family will wash the student´s clothes once a week without extra costs. Residence (12-17 years): in a single room on a full board basis. Meals are served in the cafeteria of the school. Bathrooms are shared. Students can wash their clothes in a launderette nearby (this service is not included in the price). Curfew: students will be at home around 19.30 after the social programme. After dinner, they must be in bed before 9.30 pm. Our summer English course will rapidly improve your level of ability in a short amount of time. With a maximum of 15 students per class, you will enjoy learning through exercises focusing on speaking and listening. School teachers are highly qualified and students receive 20 lessons English each week, divided into 4 lessons per day. There are mixed nationalities in each class. In the very first English class, students are asked to take an English test. The test includes writing, vocabulary and an oral interview. This allows the school to place you in the right class for your ability level. Classes usually take place in the morning but it is possible that some days there will take place an activity in the morning, and therefore classes will take place in the afternoon. The youth course also includes stay in a host family or residence with full board, an activity programme, 1 day- and 2 half day excursions per week and use of teaching materials. Accommodation in a host family is only available for juniors from 13 years old. The price stated here is for an airport transfer on arrival at London Luton. Please fill out on the booking form ("remarks") on which airport you will arrive. Please note that an airport transfer is obligatory for juniors. Sharing the daily life and experiences with an English family is a great opportunity to immerse yourself in local life, and practise your English in a friendly and informal atmosphere. All host families are monitored and vetted and live within walking distance from the school or close to a bus stop. The accommodation is in double rooms with full board. Breakfast and evening meals will be provided by the family and lunch will be taken at the centre. Packed lunches will be provided for any trips. The family will also provide laundry service. Accommodation is in standard single bedrooms, with 4 bedrooms sharing each bathroom and kitchen. The accommodations are located in the campus of the Berllerbys Campus, where you will also have all your classes. The accommodation is with full board, with breakfast and dinner served in the cafeteria. Lunch may be in the cafeteria or is a packed-lunch for trip days. A warden is available 24 hours a day for your security.